Everyone wants to have a handy, soft and well textured bathrobe. After a warm and relaxing shower, you may want to take a bathrobe or a bathrobe that will warm you up as soon as you get out of bed. Where to use your robe will be decisive in terms of the model. If your home is generally cool, it would be useful to cover your legs and prefer a bathrobe extending to your knee. You may want to use your bathrobe in the gym, school, or use a bathrobe where you can experience ease of use during your hospital stay. You may want to buy a bathrobe for your honeymoon or for the process you will come to. The quality of the bathrobe: The main factors that determine the quality, where the bathrobe is produced; body options and raw material. Bathrobe Model: Looking for a long bathrobe or a short bathrobe? Is it preferable to be heavy and textured or lighter? Bathrobe Color: Do you know your bathrobe size? Which color suits your taste? Believe it or not, bathrobes are produced with a variety of raw materials. These raw materials start from polyester, nylon, synthetic species, goes up to 100% cotton. Nylon and synthetic ones are usually cheap ones; because the production of these substances is cheaper. For this reason, the most important point when buying a bathrobe is that you prefer the first quality towel; So you don’t have to throw it in a short time or your money doesn’t go to the trash after the first wash. Another reason I would suggest you not to buy the synthetic product is the feeling that it feels on your skin – it doesn’t want to disturb the skin of a nylon, artificial product. The hooded bathrobe is also practical, as it allows your hair to dry and also does not require a head towel. If you are looking for a bathrobe to use on hot summer days or if you can’t stay comfortable with thick type robes, these models are for you. 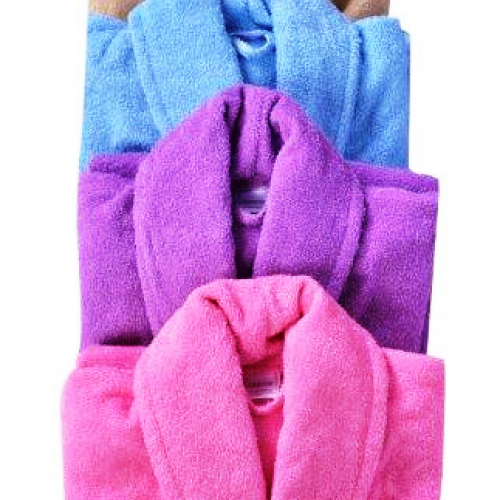 These bathrobes, which are used in spas and hotels, are suitable for washing many times. After choosing the towel type, model and size, the turn comes to determine the color of your bathrobe. Paying attention to washing instructions when buying your favorite color is very important for preserving the color. The disadvantage of buying a colorful bathrobe will be the discolouration after long washings.